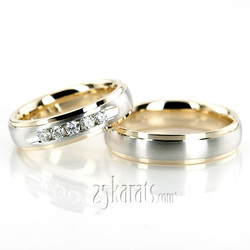 A gorgeous wedding band set for her and him! 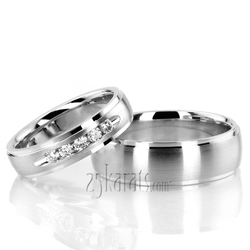 His ring is 6mm wide, also available in 5, 7, 8mm. 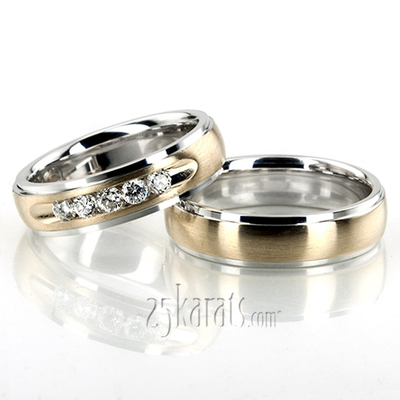 Her ring is 5mm wide and set with 5 round cut 0.05ct diamonds, totaling 0.25ct. Diamonds are graded G in color and SI1 in clarity. Center of the band is satin finished. 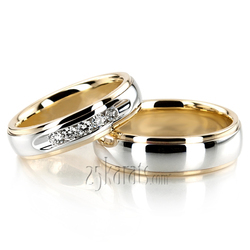 Each side is high polished. Total Gram Weight*: 19.31 grams. Diamond size 1: 5 pieces x 2.4mm Round cut with Burnish Set - G/H Color - SI1 Clarity - 0.25 ct.tw.